The job of a Special Education Administrator is one of the most challenging in a school district. Your responsibilities include overseeing the forward momentum of students with unique learning curves for whom there is no exact curriculum plus a thousand legal requirements that directly equate to funding for the entire district and reflect a district’s highest threat of legal conflict. Kids, staff, schedules, and expectations require constant adaptation, modification, and flexibility. Parent perspective, insight, and ideally, acceptance is a required part of the job. When you’re new to any position, it can be overwhelming to know what to care about first and most. There’s a lot of new information and a stream of personalities coming at you all day, every day. Each person has an idea of what they think you should be paying attention to and what’s important. I’m not one of those people. In fact, I’m the opposite. 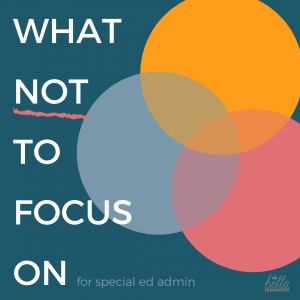 I’m here to tell you what not to focus on as a Sped Admin. Don’t focus on everything looking the same for every student. The most often letter ignored in IEP is the I. It stands for individualized. Your staff not only should not but they cannot write everything the same. If there is an understanding of expectations among the team and parents are happy, concern levels should be low. Who cares how many minutes of service a kid is getting if it isn’t relevant? I’ve sat in meetings where admin and teachers and parents peck like chickens at some magical number of minutes and how they’re to be documented. Who cares if it’s 30 a week or 480 a year if no one knows what the point of it is? Instead, focus on answering the question “How does this number of minutes translate to progress in general ed?” If no one can do that, it doesn’t matter how many minutes there are or how it’s written. Don’t focus on believing direct service is what matters. Special education has been crafted to primarily reflect pull-out services everywhere. And there are times that’s needed. But imagine the growth of kids if specialists actually were encouraged to talk with other teachers to pass along best practices and guidance. Highly value consultation and collaboration between staff and watch how your team culture changes. Don’t focus on believing parents are always wrong. When parents get heated, admin and teachers can get skeptical and inflexible in their thinking in the name of “winning.” Parents can be emotional, demanding, and intimidating as advocates. And special education can, ironically, silo parents because districts fear legal action. But leaning in to say, “What do you think will help?” and then listening and changing course (if needed) can prove one of the most effective tools you have. Don’t focus on micro-managing staff. The path to peace, productivity, and child success is not paved by ensuring everyone’s workday is the same. Sure, there’s a need for accountability, but how does telling a specialist how long their report should be move you both forward to the greater goal? The same everywhere doesn’t equal good anywhere. You have a unique, systems-level view of your department. Focus on that and leave the details to your front-line staff. Don’t focus solely on the perspective of your long-term staff. No, no one’s wanting to stretch the truth. Or gloss over their sketchy past practices. But self-preservation and self-interest always frame our perspective. So trust yourself, too. You’re smart. Seek the balance between “This is the way we’ve always done it” and “Scrap it all and create everything brand new from scratch.” Listen to and trust your staff, but don’t forget to keep it all in perspective. 50% of all sped teachers leave the profession within 5 years. Sped admin turnover every 3 years, if not faster in most districts. For the academically minded, check out see this awesome dissertation by Amy Meeks on what drives sped admin turnover. Hint: low pay, massive stress, lack of support from your boss, and politics drive folks away in droves. But that doesn’t have to be you. Remember, you started this job because you wanted to support kids. Keep your focus sharpened on them and their needs and you can’t lose.